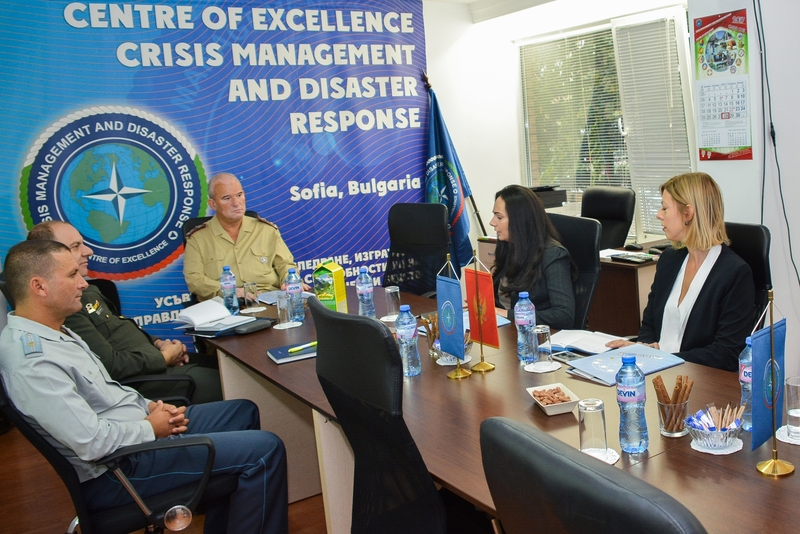 A Montenegro Ministry of Defence Delegation, led by Mrs. Alma Adrovic, Head of the Public Relations Service, visited the Crisis Management and Disaster Response Centre of Excellence (CMDR COE) on September 28, 2017. The delegation attended a meeting with COL Milen Milkov - Education and Training Branch Chief and LTC Anastasios Vasileiou - Doctrine and Standardisation Section Head. The meeting was organized as part of the “Visit of representatives of Public Relations Service of MNE MoD” event from the Plan for bilateral military cooperation between BGR MOD and MNE MoD. NATO and the Republic of Montenegro cooperate on democratic, institutional, and defence reforms, in addition to working together in many other areas, including in the crisis management and disaster response domain. During the meeting, Colonel Milen Milkov delivered the overall CMDR COE presentation that facilitated the better understanding of the Centre’s role and function as a focal point in the Crisis Management and Disaster Response (CMDR) domain. The presentation was followed by a discussion on the possible ways of future cooperation between CMDR COE and the Ministry of Defence of the Republic of Montenegro in the Crisis Management and Disaster Response domain.